Diego Simeone, the manager of Atletico de Madrid, writes a detailed first person account of his management philosophies along with an analysis of the last few stellar seasons with Atleti. "As his manager, I have to recognize that his way of being converted to become my best student on the pitch. It was as if I were playing and could direct the strategy of the team from the field of play. He had a sixth sense to know what to say to his teammates at any time, how to motivate them when they needed it and how to maintain the proper attitude in every situation." --- Luis Aragones from the prologue on page 17. "I experience football and life in an intense manner. I have a spectacular motivation when I have to do something. I go crazy. Something begins to run through my veins and gets me excited. If anyone tells me that I can't break a wall with my head, they are mistaken." --- Diego Pablo Simeone, "Simeone: Partido A Partido. Si se cree, se puede," (Simeone: Game to Game. If you believe in yourself, you can.) page 51, published by Plataforma Actual of Barcelona, Spain, in October 2014 with a list price of 17 euro. This book was a revision of one entitled, "El efecto Simeone," that was written by Santi Garcia Bustamante in 2013. 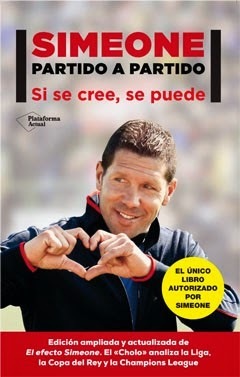 It remains the only book authorized by Diego Simeone himself. This edition provides Simeone's insights about Alteti's break-out 2013/14 season that saw the Madrid club win La Liga and finish runner-up to Real Madrid in the Champions League final. Unlike the first version, this one is written in the first person by Simeone (although he was assisted by his chief press officer at Atletico de Madrid, Jose' Luis Pasques, with the three appendices according to the publisher). Let's take a look at the contents of this intriguing look at Diego "Cholo" Simeone. I will translate a few key quotes from each chapter and the appendices, respectively. There is a prologue by Luis Aragones (who managed Simeone at Valencia), six chapters, along with three lengthy appendices. There was no detailed index although the table of contents had sub-topics for each chapter to orient the reader. I believe that an index would have been helpful especially since the author discussed many topics. This book is laden with highlighted quoted material from Simeone. Many of his key sayings are in boldface type and centered for emphasis which was a good editorial touch. I also liked that there was an entire chapter dedicated to Simeone's sayings. Chapter 1: I believe in this. Chapter 2: Heart as a guide. Chapter 3: Managing Humane Teams. One of Simeone's high intensity training sessions at Atletico de Madrid. Diego Costa was sent out on loan in 2011/2012 to Rayo Vallecano by his parent club, Atletico de Madrid. "He was a great group motivator. He managed us with a tremendous clarity and the group believed in him." "He was my idol. As a manager, he was the type who could transmit things only with a look." "He knows how to get the most out of each player. When you've been in his team, you come away from it as another player. In training, he went over what could happen during games. He tried to take advantage of each part of daily work to improve the player. For him, daily training wasn't a mere formality just to pass the time." "I learned competitive know-how from him. He is one of the managers who left his mark on me the most." --- Quotes from pages 123 to 125. Chapter 5: Diego Pablo Simeone. The "Cholo." Chapter 6: The Word of Simeone. Thank you to (@MichaelFranco84) who provided me with the Vine above. with his excellent work at Atletico de Madrid. Simeone communicates in a concise, passionate, engaging and detailed style. He is very observant and curious about people along with what motivates them; however, he strongly believes in the team ethos. These traits contribute to his implementation of individual and group psychology techniques. For Simeone, it is his job to make the twenty-third player on his roster feel just as important as "el crack," or the club's top player. Given his trophy haul at Atletico de Madrid, few can argue with his methods. One salient feature of this book was the author's emphasis upon verbal and non-verbal communication skills as a key driver in his management success. Simeone views the game itself and training sessions as continual teachers. He interprets his role mainly as a motivator, an integrator of the entire playing roster and a visible hands-on leader who uses few but well-chosen words at opportune times. Simeone is demanding. Not all footballers can play for him or flourish in his system. Diego Simeone is a footballing version of the modern MBA graduate: Someone who understands textbook theories and puts management principles into more realistic action. In a complementary fashion, like old-style football managers, he prefers a more traditional type of player who doesn't require constant coddling, avoids excessive media attention and is self-motivated to improve. Signing copies of his book during a contest. There were no schematic diagrams; however, Simeone included a few photographs from his childhood and playing career. My favorite image was one of a young Diego conducting a school orchestra in Buenos Aires, Argentina. Even at that precocious age, he was a leader. Diego Simeone has written an excellent first person account that provides us with a deep look into "Cholo" the man and football manager. He is passionate about his work and has placed Atletico de Madrid on a global stage in a few short years. Most of all, he is one of those rare leaders who holds himself fully accountable for failures and credits his players for successes. It was a great pleasure to read and review this book. Diego Pablo Simeone was born in Buenos Aires in 1970. After a successful professional football career in Argentina, Spain and Italy, and with 106 caps for Argentina, he began his management career in 2006. His philosophy which is based on effort, motivation and sincerity has allowed him to significantly improve the teams he has managed in an extraordinary manner. Atletico Madrid is the best example. Biographical text courtesy of Plataforma Actual with my translation from the original Spanish. I have received a complimentary review copy from a representative of the publisher, Plataforma Actual. I was not financially compensated by a representative of the authors, publisher or any other party who would benefit from a positive review. @worldfootballcm @si_soccer: And thank you for your help translating quotes in various languages. Always a great asset to have.